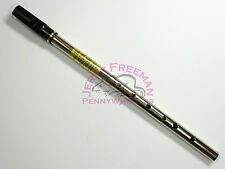 Dunfion Smallpipe Chanter in A. High quality balanced tone. THE "BIRD WHISTLE" IS PLACED ON THE TONGUE, IT IS HELD UP TO THE ROOF OF THE MOUTH, AND BY SAYING SSSSHH,SHRILL NOISES ARE PRODUCED. WITH PRACTICE LOTS OF DIFFERENT SOUNDS CAN BE MADE. 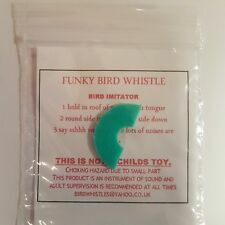 THIS IS THE ORIGINAL FLAT "BIRD WHISTLE". New and high quality Stylish design Easy to carry perfect gift for your amiou yourselfColor : Silver Dimensions: 180 x 46 x 33 mm16 holes Note:Do not play this to top to avoid dropping the broken parts in the mouth.Wash with warm water below 40℃, do not use boiling water or alcohol, oil or chemical detergent.Store at ecartde the heat, do not put it near heat or in direct sunlight.Place the harmonica in the box when not in use.Package Included：1x Harmonica1 x Cleaning clothNote:Light shooting and different displays may cause the color of the item in the picture a little different from the real thing. The measurement allowed error is /- 1-3cm. Brand Unbranded MPN Does not apply UPC 4894462266021 EAN 4894462266021 ISBN 489446226. 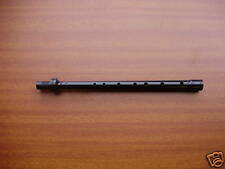 Kevin Crawford demonstrates a Freeman tweaked D Blackbird whistle - YouTube. PERU: OKARINA-FLÖTE 1 Stück aus Ton buntes Muster Ocarina Peru Tonflöte genial, NEU. Die Okarina stammt aus dem alten Kaiserreich Chinas. Bekannt wurde die Flöte hier besonders durch den Film "Pokemon 2000 The Movie". If you are in the UK, there is probably a branch of Hobgoblin Music near you. Atlas Large Ceramic Ocarina, in D. Traditional Ocarina. Buy from the experts for the friendliest service and best after-sales care! We use synthetic wood not only for its strength but, for its sound. Our material will not absorb the sound as it travels through the body of the didgeridoo. Therefore, the sound is projected louder then ever and consistent no-matter the humidity. good working amp, two 8” Weber speakers, two 6V6 and 12AT7 tubes - great condition has scuff mark to handle - comes with nice amp cover - normally these amps are 2x8 vertically arranged, this one was custom ordered horizontally arranged - please bid accordingly and only if you are willing to accept it as is, no returns - please only purchase amp if u intend to keep it, as stated we do not accept returns on amps - $65 S/H to Continental U.S.
• • • We really try to offer a complete 5 star service. If for some reason there is a problem with any transaction please give us the opportunity to remedy it. • • ￼ Powered by eBay Turbo Lister The free listing tool. List your items fast and easy and manage your active items. Tune for Nay Sipurde D (RE) 570-600 mm. This pro ocarina, key of A4-F6, is tuned in the key of C, and can go below C down to the A. This ocarina has exquisite breath response and crystal clear tone. 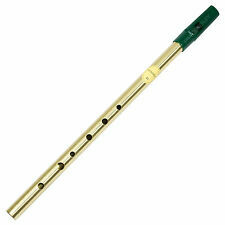 Professional 12 Holes Alto C Ocarina Flute. 12 Mundharmonikas. Alle Mundharmonikas sind gebraucht mit Gebrauchsspuren. - M. Hohner. - M. Hohner 580. 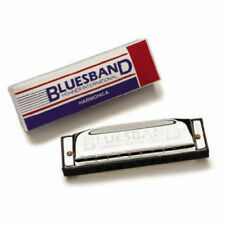 Blues Harp. Demnach gelten u.a. folgende Bedingungen Preisvorschläge sind bindend und behalten jeweils 48 Stunden ihre Gültigkeit. Scottish Smallpipe drone reeds for A or Bb bellow blown Smallpipes although they have been used in mouthblown sets like Gibson Fireside™ Smallpipes and many others. This is my standard design and doesn’t require any tongue springing. The reed is adjusted with small bridle movements which adjust the elevation of the tongue and it’s vibrating length thus varying the pitch. The reeds have tongues that are easily removed for cleaning or changing tongues to vary pitch. I also offer experimental reed sets with 3 tongues per reed, reed tongues that can be swapped to raise or lower the pitch of each reed to experiment and fit almost any set. Cheers, Hamon Bagpipe Co. Warm, sweet tone, wholesale prices. Made to order. TUNES IS COUNTED for 5 finger closed on top and 1 finger open at bottom of Ney. Material: Bambo Reed. 68,5-715 cm 28". Mansur A (La). 440 mhz western styles. The simple, elegant design of the Harparatus looks fantastic on your mic stand without adding clutter and is fully adjustable and functional. 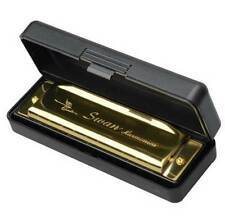 Two strong neodymium magnets hold your harmonicas firmly, yet allow for quick one-handed harp changes. Zelda Blue glaze. Legend of Zelda 7 Hole Songbook included. Treasure Chest. The Ring of Platinum. This piece probably dates to the 1920's or 30's and is in wonderful condition. Hohner Marine Band. Plaqué or 24 carats - Une pièce rare à trouver. Édition limitée pour les 100 ans de ce modèle 1896/1996. Pas de mauvaise surprise de ma part soyez en sûr, vous achetez ce que vous voyez ! Warm, mellow tone, easy to blow. Wholesale prices. This FlexRack harmonica holder by Hohner is the only rack that can be adjusted at 3 separate points without tools. You can adjust position, height, and angle. Easy to adjust and sturdy construction ensures stability and reliab ility during performance. The Johnson Blues King Harmonica Set. 12 keys: Ab, A, Bb, B, C, Db, D, Eb, E, F, F# and G. Johnson Blues King Harmonica Set. Bass Guitars. Ending Soon. A broken string is not considered to be a "defective" product and/or "not as advertised". 10 holes, 40 reeds. NEEDS A BIT OF CLEANING.